Maybe you’ve thought about trying yoga but haven’t worked up the nerve yet. There’s something very appealing about that calm strength that you see from other yogis. Imagine yourself serenely standing on your head on a beautiful tropical beach with a calm smile on your face. Sounds unbelievably great, right? But, you don’t need a beach or have to be able to stand on your head to get that same feeling— you just need a little yoga. So, here are some reasons to try it and some tips for getting started. Many people try yoga for the physical benefits (there are lots!) but quickly realize that yoga is so much more than a workout. But for now, we’ll focus on those physical goodies. 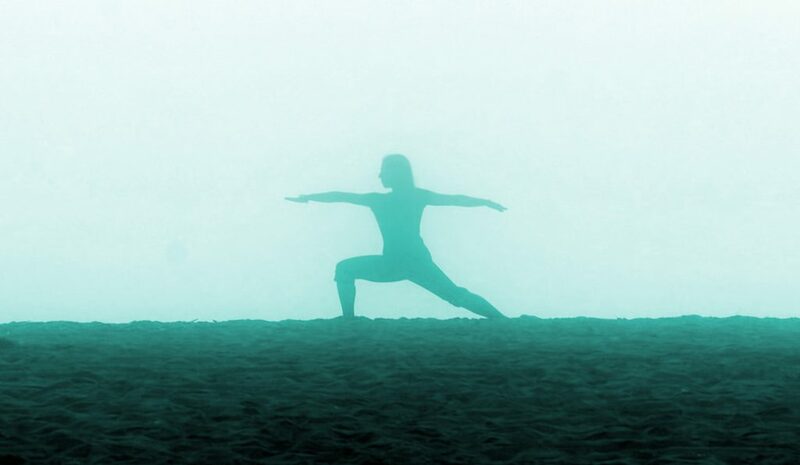 Yoga on a foggy beach! Calm warrior. Yoga will make you strong, no doubt. It will also make you more flexible, and strength and flexibility are a very powerful combination for avoiding injuries. You can do just yoga or use it as cross-training for your other workouts. Because there are different styles of yoga, it can be shifted to varying degrees of intensity, all with super benefits. If your goal is to heal injuries or to improve your fitness in general, then yoga is your friend. You already know that physical activity is absolutely necessary for balance in your life and health. Yoga is great no matter how busy you are because you can do it anywhere, anytime, and get the workout you need. You can use it to get warmed up and excited or to relax and sleep better at night after your stressful day. I love doing simple yoga stretches while I’m still in bed to help me wake up in the mornings. And I use it as a warm-up for rock climbing and ballet. There are some days I’ll do a killer yoga session and I don’t need any other exercise! Yoga is a form of moving meditation. Lots of people struggle to sit still and meditate. When you move through “vinyasa”— which is a Sanskrit term for moving between poses— you’re focused on your breath and moving in tune with it. It’s meditation that connects directly to your restless mind and body. Practicing yoga allows you to become more in tune with your body and your mind. Over time, you will notice thought patterns that you have that you never realized before. 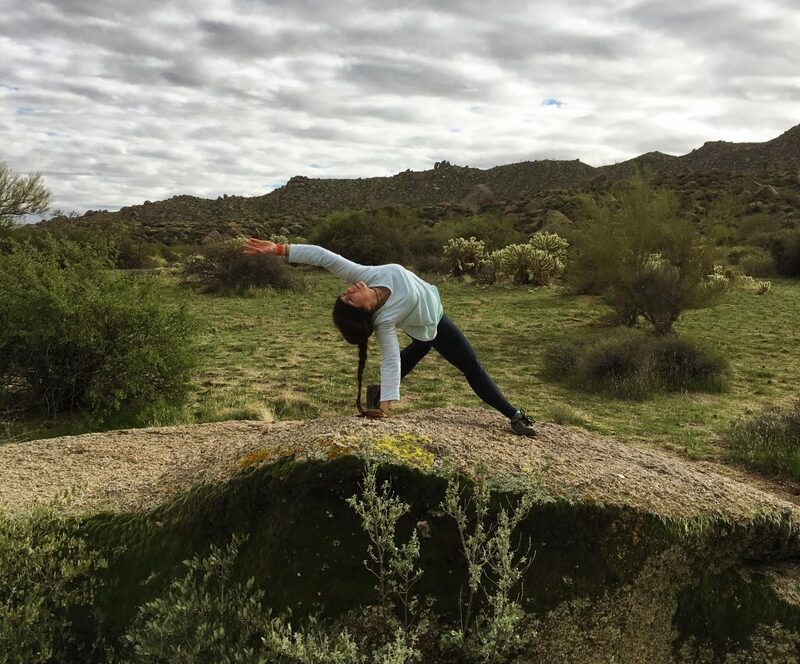 You will notice that you start to make better decisions about your health and life, and the only thing you’ve really changed is that you started practicing yoga. It’s powerful stuff. As strong as yoga makes your body, it does that for your mind and meditation abilities as well. Backbend salutations! Bending, but not breaking. And if you have a magickal practice, then meditation is a key skill to learn and master. All that learning to breathe while holding yoga positions translates directly into being better able to sit still and perform other types of meditation as well. Yoga will allow you to drop into trance much more easily at will. I love to rock climb and take ballet, and yoga has helped me identify where I’m holding tension, so I can release it and do better at my sports. It also makes me a nicer, calmer, less stressed, cooler person all around. Remember that beautiful beach I mentioned? I can create that feeling while sitting in my living room in the desert. The annoyances of everyday life are less annoying. That’s the power of yoga. The fact that you get a stress-relieving physical activity that is also a meditation practice is a win-win. All you do is win, win, win! You really don’t have to be super-thin and bendy to do yoga. You don’t. It doesn’t matter if you’re thin, overweight, super-fit, or a couch potato, there is a style of yoga that will be great for you. Even if you struggle to just sit up straight, you can use props in yoga to help you get into alignment and work your body they way YOU need to work it. 5) Yoga Can Be Social— Or Not! Introverts fear not! Yoga is totally something you can develop and do on your own time, in privacy. Or, if you want to be around other people, you can take a class. There are even free classes and workshops offered all the time in most places! Or, get a group of friends together to do some yoga in the park. It is truly an activity that will work no matter what it is you need to get from it. If that’s relief from other people and drama, that’s what you’ll get. If it’s connection, that’s what you’ll get! One great thing about yoga is that you really don’t need much stuff. There are lots of fun things (like yoga wheel ) you can get, but the only thing really necessary is you. 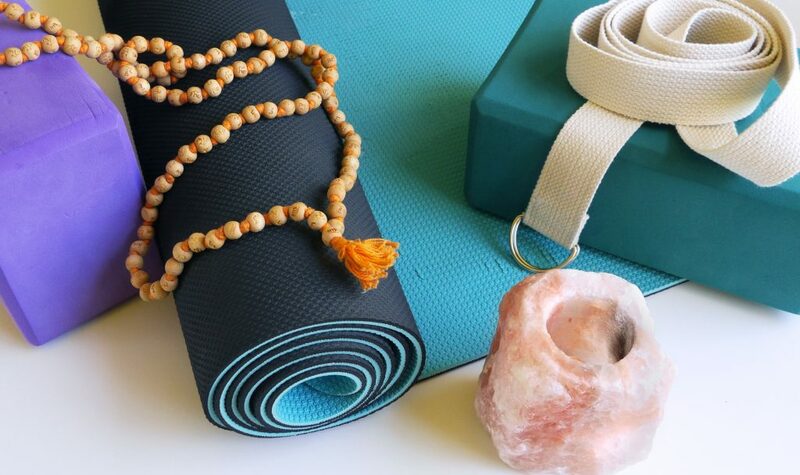 These are a few of my favorite (yoga) things! You can see my mat is just starting to wear out after 3+ years of use, so I would definitely recommend this one! If you have a good surface to work with, you may not even need a mat. But a good mat is a great thing to have, and probably the only “necessary” thing other than yourself. When I first started, I noticed that I was getting queasy and headaches every time, but it wasn’t yoga making me sick, it was my mat. Most are made with toxic chemicals that gas off, so it’s definitely worth it to get yourself a good, non-toxic mat like the one in the picture above. Something else that could be helpful is a couple of yoga blocks . These can help you get into positions, and for the already flexible, can even help you get deeper stretches. Stacks of books work too. There are a lot of fun yoga “things” out there, like bolsters and meditation pillows and bags (I like this one ) and stuff. I just have a strap to carry my mat, which I also use to help stretch. The last thing that might be necessary that I would recommend is one of these Mexican yoga blankets . These are wonderful because you can fold or roll them to make various kinds of bolsters and supports. They can even double for a mat outdoors. I keep one in the car and it also makes a perfect picnic blanket! They’re beautiful and multi-functional. I’d get this before getting a bunch of bolsters if you’re just starting out. Also, you do not need $100 yoga tights . Get them if you like them, but don’t feel like you have to “look” the part. I do yoga in an old leotard and some cut-off sweat pants and a t-shirt usually. I’m not trying to make a fashion statement, I just want to get my yoga on! I started with YouTube videos and this is what I would recommend before you go and invest in a class. The exception to this is if you have some kind of injury or mobility problem and would need some professional guidance right from the beginning. In that case, talk to your instructor first and let them know what issues you might have. A yoga instructor should NEVER push you into any pose or position. They are there to guide you and give you feedback for how to get there yourself. Also, you won’t have to be worried about being self-conscious in a class. You can build up your confidence and your strength without feeling like people are watching you (even if they’re not.) At some point, you’ll want to take a class (even free ones!) so you can get some feedback and corrections. But there’s nothing wrong with doing videos in your living room until you’re comfortable enough to go to a class. Expect some of the “resting” poses to not feel like rests at first. You’re going to spend a lot of time in downward dog, and it takes shoulder and hamstring and core strength. It won’t take long until this actually is a place to chill out and catch your breath! Yoga pushes you to grow physically and mentally. This means a lot of breathing through discomfort. Stretching or holding a pose is going to be a little uncomfortable at first while your body adapts to it. You have to be able to judge for yourself the difference between “discomfort” and “pain.” Discomfort = growth. Pain = injury. Be honest with yourself and what you’re feeling and don’t push yourself too far, or not push enough. Also, your limit is going to vary day-to-day. Judge your progress over the long term and in how you feel, not by comparing yourself to others. Be patient with yourself and you’ll be doing things you never thought you could do in no time! Expect to want to do yoga everywhere, especially in beautifully inspiring locations! Wild Thing is one of my favorite poses. It makes my heart sing! Oh yeah! There might be some chanting! If you haven’t tried mantra meditation before, give it a shot. Usually, it’s just “Om,” which is the primordial sound of the soul, and you feel it. It’s really cool. That’s it! I hope I’ve convinced you to give yoga a try. It’s had such wonderful effects on my life (and my magickal practice) that I had to share it here. If you found these tips helpful, or have something else to add, let me know in the comments below!